Andrew Tischler’s travels on the TRUE NORTH have changed the way he paints. In this article Andrew explains how he became involved with the TRUE NORTH and explains the profound impact of his first visit to the Kimberley. 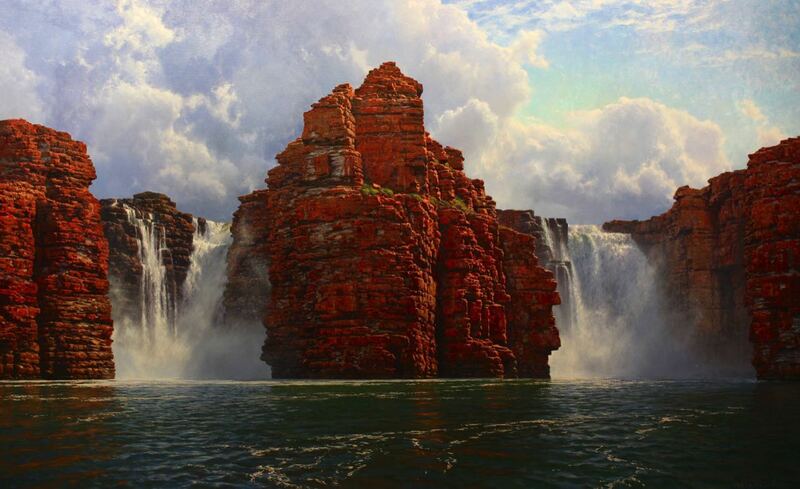 He also shares some of his favourite Kimberley waterfall paintings. Back in 2009 I was part of an exhibition at a gallery in the South West of Western Australia in Margaret River. The exhibition was all about Australian landscapes. Craig Howson, the Director of North Star Cruises, along with Peter Trembath, General Manager were both in attendance at the exhibition and I met them. Craig seemed really enthusiastic about my work and he said, "Look, you're doing some nice Australian landscapes, how about you come up and check out the Kimberley?" I'd only seen pictures of the Kimberley. I'd been dreaming about getting up there, but of course one of the biggest issues with that part of the world is accessibility. It's very difficult to get to and it's very difficult to get around once you get there. It was amazing to have this opportunity to access that landscape in best possible way, from the water. Just to be able to take in these views and these vantages that so few people, let alone artists have seen, was a real privilege. For me it was an amazing experience in expanding my horizons artistically and opening up a new subject matter that I'd only dreamt about painting previously. My first visit to the Kimberley in 2010 changed my practice. When I first got there I was painting en plein air, which is a French term meaning in the open air. It was pioneered by the Impressionists. I had a little sketch box with me with oil colours and my brushes and the panels. I was producing paintings pretty much on a daily basis on board. That allows me to draw inspiration directly from the landscape and get the ideas down while they're fresh. It also means I can get the colours and the palette of the Kimberley as true to life as I possibly can. 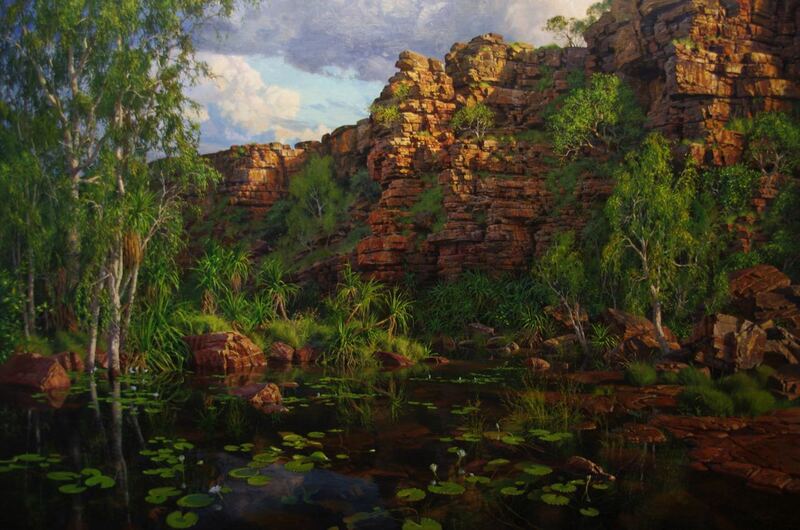 One of the things that really hit home for me back in 2010 and really was quite frustrating was I wasn't able to recreate the colours of the Kimberley with the paint that I had. I was forced to come back to my Perth studio and buy all new paint and completely change my palette and retrain myself in how to work with colour just to get the intensity and the vibrancy of that landscape. I also started opening up to the idea that I could paint landscapes, representations of reality, in a more imaginative way. In a way that was more reminiscent of painting back in the 19th century during the Neoclassical and Romantic periods, where artists were really captured and inspired by this notion of the landscape as a manifestation and direct creation of the divine. I wanted to create something that evoked a little bit more of an energy, a little bit more of an emotional response, and that wasn't exactly tied to the way it was on that day as shown in my reference photographs. This painting is inspired by King George Falls. It is such a spectacular place and it really shook me up and inspired me. Here I’ve painted the falls in pretty much full wet season flood. It’s late in the afternoon with a high light on the falls. I haven't seen the falls in this light, I had to reimagine and I did a lot of research from my own photographs, recreating the scene and recalculating light angles just to get a consistent light throughout the scene. It was something that I had to compose and imagine in the studio. What sets off this painting is the billowing thunderstorm in the background. You get this feeling like there's an approaching storm and it's flooding the plain above the falls and it's just causing this enormous rush of water. 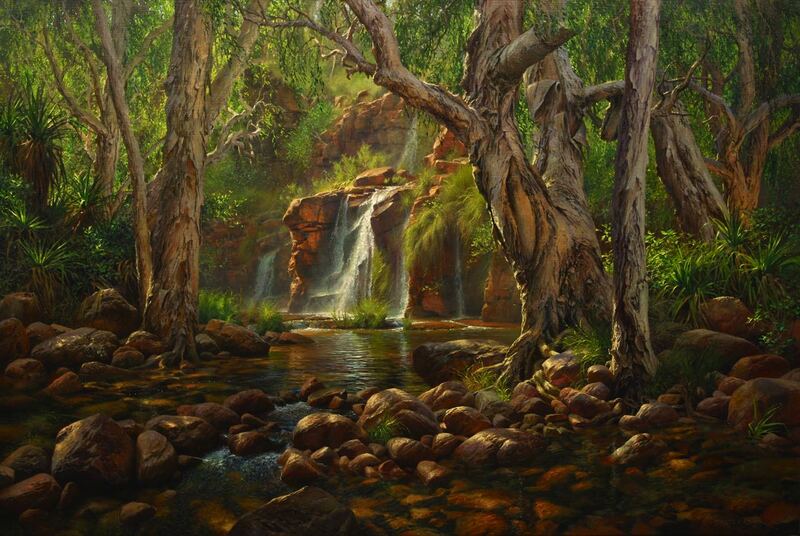 This is one of my favourite paintings, and is an example of what the Kimberley does to me. It makes me think about the landscape and think about the raw, rugged energy of nature in a very different way. Often when I'm thinking about paintings and landscapes in my studio, I'll be asking myself, what would I like the viewer to feel? What emotion or energy would I like to recapture? What did that landscape inspire? What would I like to come back to and feel again? When I'm talking in terms of energy and emotion and the spirit of a place, very rarely does that mean then that an image has to hinge on and adhere to exactly the way a place looks. Part of the issue that artists face nowadays as a result of technology, being cameras and photographic images, is that we're tied to a particular representation of a place with a particular vantage point at a particular time. Paintings are not fixed to those rules as such, so we can move around and invent and use artistic licence. This particular scene is based on a waterfall I saw on a hike. This area is in and around the Hunter River region. Those paperbark trees were at the mouth of the river and weren't quite that established. There was no area that had this same cavernous feel, but it's rather the way the landscape felt to me walking through it and the progression of that hike. You're starting at the mouth of the river and you're walking up to this little, secret waterfall at the end of the walk. For me this is a compression of all of those experiences all happening within the one image. Yet, it's cohesive enough that it works as one image. I find that somebody who has experienced the same landscape will then turn around and they'll look at that and say, "Oh, I've been there. I've seen that, I have experienced that. I know exactly where that is.” That’s how I know that it's hitting on the right number of emotional triggers for them. I find it's truer to my experience rather than just painting from one fixed image like a photo. I’m painting my emotional response to a landscape by taking elements of the landscape and blending them together you get a more accurate representation of the experience of being there. This is part of why it's so necessary to be immersed in that landscape, and again I should add why I'm so grateful to the TRUE NORTH for giving me that opportunity because it helps me create paintings like this. Before I went onboard TRUE NORTH for the first time in 2010, I said to myself I wasn't going to go on the chopper because the chopper didn't really give me the vantage point that I thought would offer a natural view. I thought that it would be obvious that it was from a chopper and there was no way that I could really paint that in a way that was honest as the way a viewer would experience it standing from a fixed vantage point or experiencing it. How wrong I was, because when I got up there for the first time I was like, okay, this is incredible. I actually saw a certain pattern and order and harmony to the Kimberley landscape that you can only see from a high vantage point. Also you get to appreciate the sheer scale and the sheer magnificence of nature when it gets an opportunity to show off in an area like this. You have to see it from above. This was one afternoon, I went on a scenic flight, Rob was the pilot and it was an amazing flight because he circled in around all these little waterways and drainage courses and waterfalls that just cascade at these great heights. That afternoon it was a really overcast day, so I had no direct light. When I reinterpreted the scene and redesigned it, I wondered what would this look like with a direct light source on it? I was pretty happy with the finished results. This piece is titled Hidden and to me that title is significant in the way that the Kimberley is all about things that are hidden. Little treasures, gems, jewels for you to explore and discover for yourself. To me it's a special place, this waterfall, because it's the result and it's your reward for putting in the effort to get up there. It's like that treat at the end of your journey. This was only a very little painting, but it still remains one of my favourites. This is Melaleuca Falls, which actually doesn't highlight the falls at all, but it takes in this beautiful little reflecting pool just before it spills off into its next tier. This is one of my biggest paintings to date. The Kimberley has got a lot of drama to it, but in this I was trying to capture a quieter mood. It's a painting of a place that you would rather be. I'm hoping that the viewer feels some sort of sense of tranquility and calm and peace when they look at it. This is about a peaceful place between two tiers of the waterfall. It is a peaceful retreat between the dramas on either side. You've got the fall that's about to spill away but I haven't shown that and it falls off to the right and there's quite a raging waterfall up to the left, but this just doesn't really take it in. It was just this quiet little moment. There was sunlight falling on that precipice in the background. There was just this beautiful light reflecting down through the pool and a clarity to the water where you could see the reeds and stems of all these waterlilies in the foreground. It was just one of those beautiful moments of quiet reflection and clarity. I’m hoping people might be inspired to go up and see this for themselves. I think if I want my paintings to do anything, it's to inspire people to get out there and experience this landscape. Some of Andrew’s paintings can be viewed on board TRUE NORTH.